On Tuesday October 3, 2017, John Herring, President & CEO and Ron Arden, Executive Vice President and COO of Fasoo, Inc., presented “Content Services and Security Platform for Digital Transformation”. John talked about using the power of the Wrapsody file-centric security and information management platform to simplify and enhance collaboration as businesses grow. The key to Wrapsody is a unique, persistent file ID that follows a document and allows secure sharing, distribution and tracking, and version control at the data source across all locations. It allows organizations to address issues from risk management to business performance. Ron followed John with an example of how Wrapsody enabled a company to quickly and easily create its budget for next year. Since all collaboration and interaction was around the budget spreadsheet, it allowed all stakeholders to update their sections easily without having to search for who did what when and where is the latest copy of the document. Wrapsody also has great analytics that allows different constituencies in the organization to track and manage security, compliance, governance and productivity. During the course of the Symposium, a lot of attendees and analysts came to the Fasoo booth to understand how to break through the problems of traditional file shares and document repositories. While those systems are great for organizing information, they are challenging when users have to collaborate outside the system and move files from repository to desktop to email and to the cloud. Tracking and managing documents regardless of location and ensuring that everyone has the current version is a constant battle that affects productivity, governance and security. Wrapsody simplifies this by bringing the process down to the file level and automatically synchronizes files as users create and work with them. 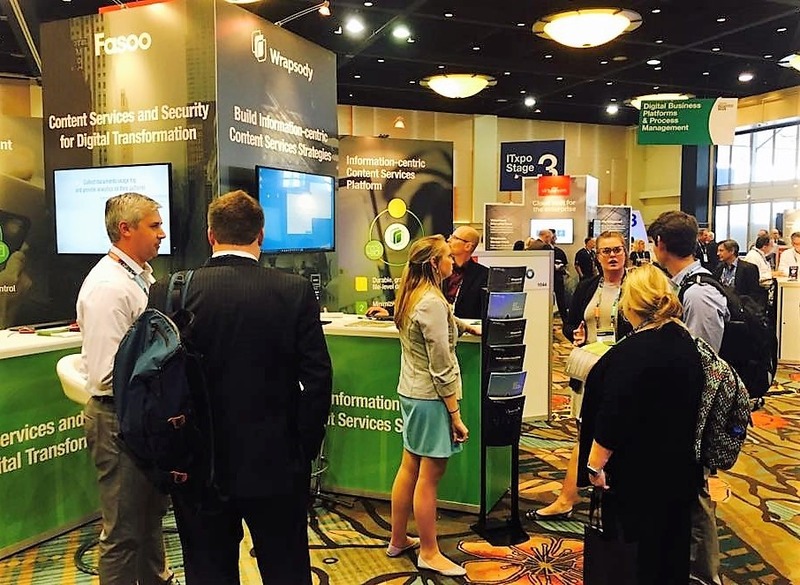 A number of attendees were also interested in how Fasoo can provide more granular permission controls with the Wrapsody platform for those scenarios that demand greater security. When a user creates a Wrapsody document, the user assigns View or Revision permissions to those people that need to access the document. The document is encrypted and allows collaboration through the organization and beyond. If a user wants to further control an authorized user’s ability to Print, take a screenshot, run a macro or extract data to an unprotected environment, those permissions can be granted. One CIO commented that she liked that flexibility, since some documents are more sensitive than others and will require greater controls. With companies trying to improve productivity and comply with numerous new regulations, such as GDPR in Europe, Wrapsody provides access control and an audit trail of wherever the document has traveled. Document owners, department heads and security administrators can see how each document has been used through a graphical dashboard. Since documents are always protected and tracked, regardless of location, complying with new cybersecurity regulations is a lot easier. One CIO from a government agency liked the analytics, since he said that understanding what information he has and who is using it is a major challenge to security and data governance. Of course no Gartner Symposium would be complete without a visit to an Orlando theme park. This year’s attendees got to enjoy an evening at Universal Studios with great food, rides and a lot of fun. Having a drink at an Irish pub or going on a roller coaster are great ways to meet new people and be a kid again. It was a nice balance with the seriousness of the main event.